In February 2007, widows and children of coal miners convened on the Capitol Annex in Frankfort, Kentucky, to testify in front of a House committee about an important mine safety bill. The legislation followed one of the deadliest years in recent history for coal miners in Kentucky. Sixteen miners had been killed on the job in 2006, and five of those deaths were from an explosion at the Kentucky Darby No. 1 mine in Harlan, Kentucky. Four months before the Darby disaster, twelve miners were killed in the Sago Mine in Sago, West Virginia. 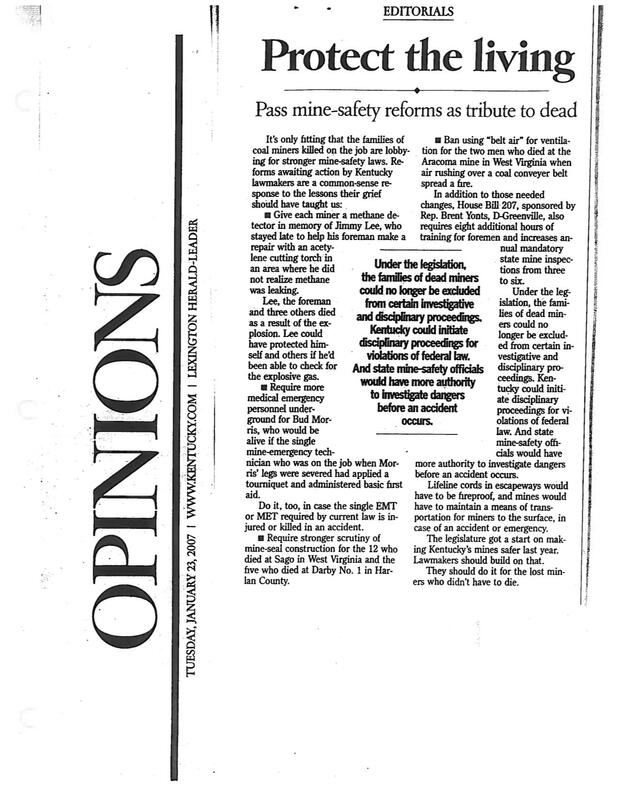 Both disasters received extensive coverage in the national press, and legislators recognized that it was time for the state of Kentucky to act on mine safety. The Appalachian Citizens’ Law Center worked extensively with the United Mine Workers to draft this legislation. Parts of the bill were ultimately compromised, but one important component survived: the number of mine inspections per year was doubled from 3 to 6. Now lawmakers are trying to do away with this requirement. Last week, the Kentucky Senate proposed a state budget that would reduce state inspections of coal mines to 2-per-year, and would cut one-third of the funding for the Office of Mine Safety and Licensing. Regardless of the outcome, the mere mention of cutting inspections is an insult to the hard work and dedication of deceased miners and their families. Additionally, the way in which the cuts were processed – without a public hearing, with no recommendation from the agency in charge of safety, and with no public discussion of how many inspectors and inspections are needed – is particularly shameful. Finally, forcing the debate into a jobs vs. regulations framework is misleading and false. Cutting the budget and the number of inspections will result in less jobs. As jobs in the coalfields are already scarce, these cuts will only hurt the situation.